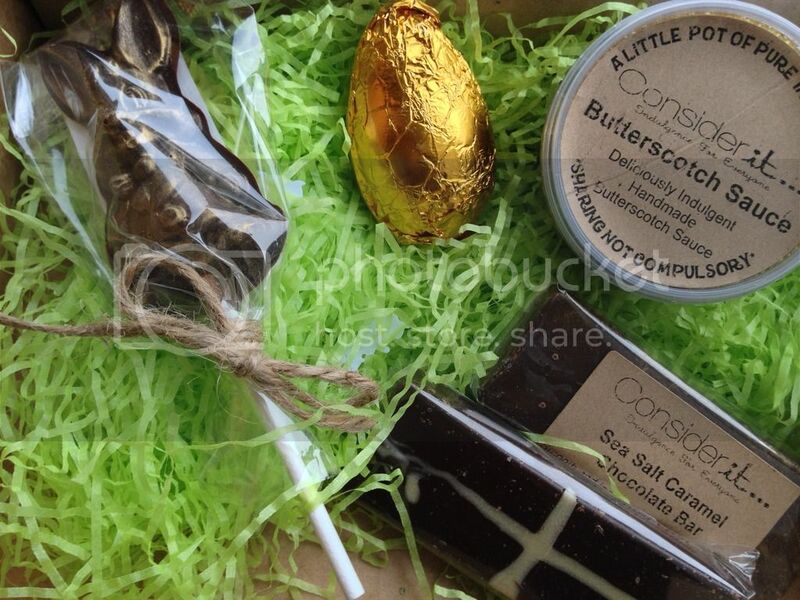 After being disappointed with vegan easter eggs in the past, and Mr Hatter's newfound appreciation for good vegan chocolate, we had decided to forego regular easter eggs this year and just place an order with Considerit Chocolate for some of their scrummy bars. The easter box contained a vegan creme egg (! 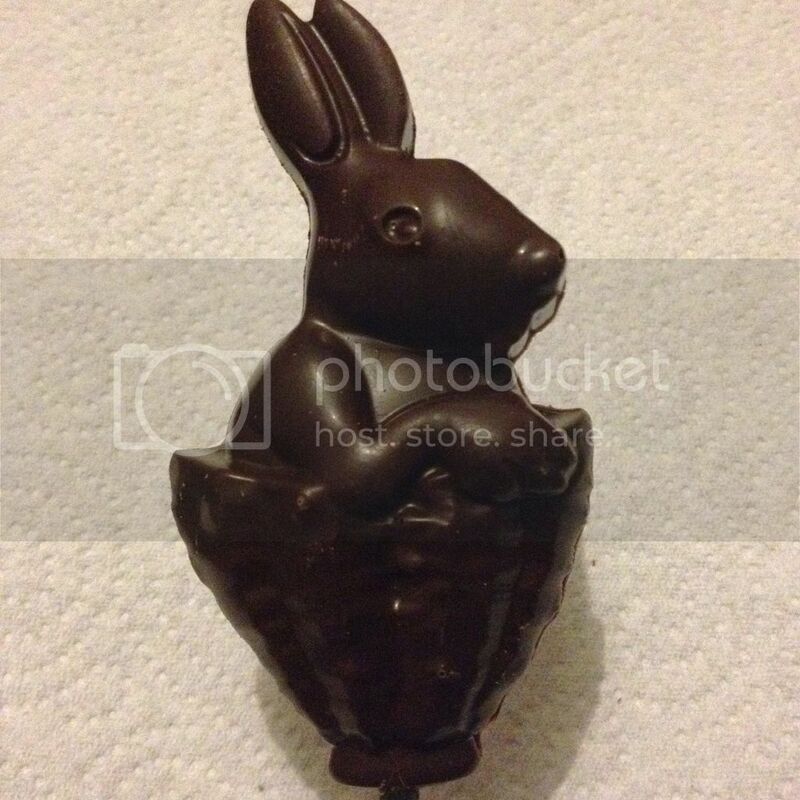 ), a chocolate bunny lollipop, a sea salt caramel chocolate bar, a tub of butterscotch sauce, and a hot cross bun truffle bar (if memory serves me correctly!). As usual, everything was amazing! I adore their salted caramel bars, so I was super happy to get one in the selection box. Everything else was fabulous too - and the festive truffle bars are so much fun as it's always a flavour you wouldn't expect! (There was also a Christmas spiced one in the Christmas selection box.) This is most definitely one of my favourite chocolate companies around at the moment. Something else we had considered buying for Easter were the amazingly impressive-looking "NO DAIRY 'milk' " chocolate eggs from Hotel Chocolat. Unfortunately I can't seem to find any of the photos on their website now, but if you do a google image search, you'll see what I mean about them looking impressive! Our only concern with these was the price - I believe it was £15 for the slightly larger egg (which we would share) or £10 for the smaller one. 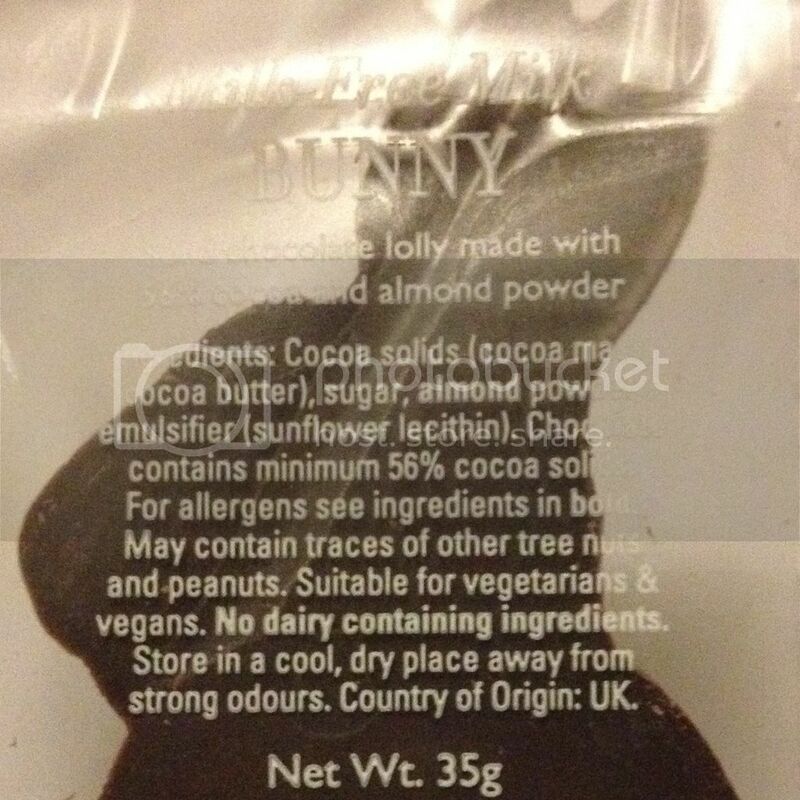 To be sure it was worth it, we decided to buy one of their small NO DAIRY 'milk' bunny lollipops each to test. So cute! The idea behind the NO DAIRY 'milk' chocolate is that it uses almond powder instead of milk powder to make the chocolate smooth and creamy. I thought this was a great idea, and even discussed it with one of the staff members who also thought it was fantastic that they were providing more dairy free chocolate. 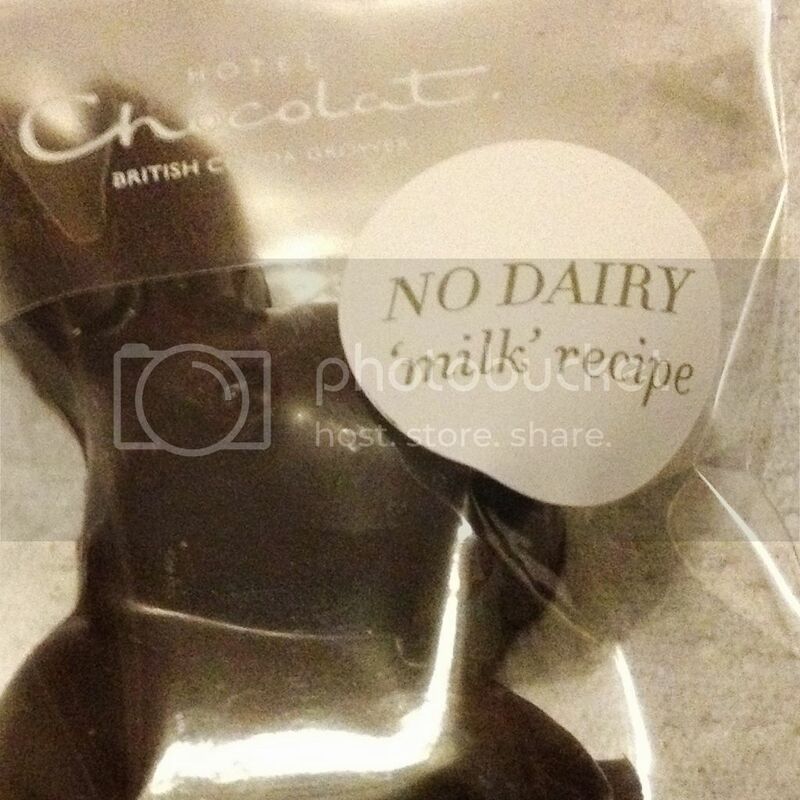 I was really looking forward to trying this, as I love a lot of Hotel Chocolat's range which already happens to be vegan (just search their website for "vegan" and you get around 4 pages of products!). However, we were both rather disappointed. Instead of being creamy and milk-chocolate-like as we expected from the name, it was quite bitter and not particularly creamy. I do love the idea though and I hope they persevere with it, as it's such a big step forward having a high street store really thinking about non-dairy alternatives to milk chocolate. But for now I think I'll stick to my existing favourites, including the "Nutty Hazelnut & Pistachio Buche", which has been firmly at the top of my Hotel Chocolat list since I discovered it.